Living in Japan, it’s actually pretty difficult to find Greek food! And I love Greek food! Hummus, Tsatziki, Olives, Feta… Mmmm. Granted, now that I’m eating more primal, hummus would be out anyway (unless I sprout my chickpeas, which I plan to do once we go back home and they’re cheap and easy to find). Aaaanyway…. I was craving Tsatziki one day and, since I’ve made it before thought I could make it again. I had all the ingredients! (Well, almost). I couldn’t find greek yogurt, so I strained the regular kind, lemons are rare and ridiculously expensive, but I had bottled lemon juice and there is no dill or mint to be found, so I used a local herb called shizo. So here’s a recipe for Tsatziki with a bit of a Japanese twist! You can still make the regular version following this recipe though. fresh dill (this is traditionally the herb used and my fave. But you can use any other herb you enjoy, or have on hand. Mint and basil work pretty well too. 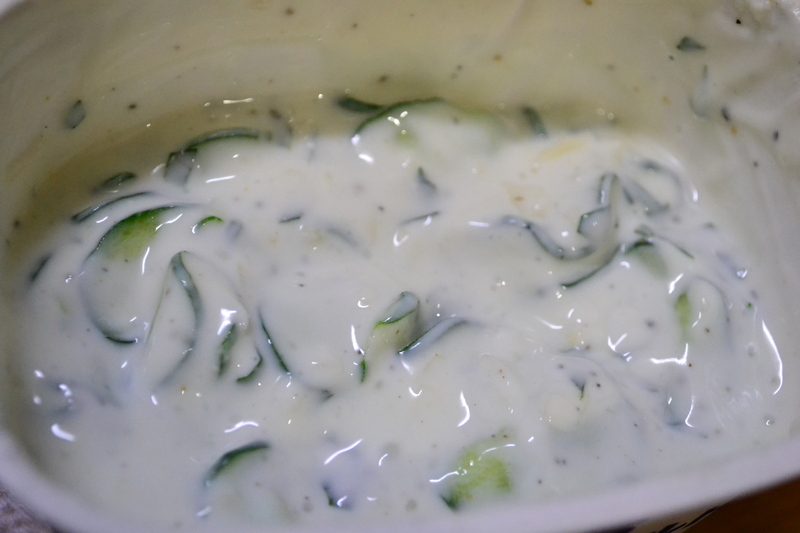 Ideally, you’d leave the cucumbers draining and the yogurt marrying with the lemon, garlic, and salt overnight. However, I don’t usually plan things ahead. I’m more of a “what am I craving now” kind of person, so I made this all at the same time and it turned out really good! You can try it either way. I’ll walk you through both methods as we go. If you’re using regular yogurt like me, you need to strain the water out so you end up with a thicker yogurt. Do this first so it drains while you prep the rest of the ingredients.You can use cheese cloth over a sieve or a coffee filter. I don’t even know what cheesecloth looks like, but in Japan they make coffee by the cup using little filters and filter holders. This proved extremely useful! So using that same idea, you should be able to strain your yogurt with no problem. I recommend straining about 1/2 a cup at a time so it’s faster. if you dump all the yogurt in at once, it’ll take closer to 2 hours. Second round of straining. It’s already thicker! This is all the liquid that came out of the yogurt! While your yogurt strains, go prep the cucumbers! You can finely slice or grate the cucumber. if you grate it, you can squeeze the excess water through a sieve and it’s easier to leave it draining overnight. If you slice them, you can lay them out on some paper towels or a towel with some salt (it draws out water) and leave them overnight as well or use them right away by following the instructions below. If you’re making this to serve right away and you grate them, it will be harder to squeeze the water out with a paper towel because they’ll stick to it, but you can use your hand to squeeze as much water out as you can through the sieve. I prefer using slices for the quick method. Lay out your sliced cucumbers, add some salt and squeeze the water out with paper towels (or kitchen towels if you have enough of them. Let the salt sit for a bit, then squeeze. Flip, then switch out towels, and squeeze again. I did this about 5 times to get most of the moisture out. After that, you can leave them on a dry towel to drain a bit more while you do everything else. pressing the water out with paper towels. While the yogurt and cucumber finish straining, finely chop your garlic cloves and your herbs. Once the yogurt is nice and thick, put it all in the container you’ll be serving it in, add the lemon juice, garlic and herbs. Give the cucumbers one last squeeze and add them in as well. Because we used salt to draw out the water from the cucumbers, we won’t be adding any salt to the mix. Stir everything together, let it sit for at least 30 minutes and serve! If you’re making this overnight, add the garlic, salt, pepper, lemon juice and herbs to your greek or strained yogurt and let them sit overnight in a covered container. Grate or slice your cucumbers, add a bit of salt and set them on a sieve / cheesecloth / paper towels in the fridge overnight to drain. The next morning, add the cucumbers in and you’re done! The longer the garlic sits in yogurt, the less sharp it becomes, so if you’re making the tsatziki to serve right away, maybe use a smaller amount of garlic. I hope that was helpful! Try it out, experiment with your local / favorite herbs! I really liked my Japanese flavored Shizo Tsatziki. Enjoy your creation with veggie chips, fresh carrot slices, celery, more cucumber, almond/coconut pita bread, regular pita bread or really anything you want! You can also use it as a topping, salad dressing, etcetera. The possibilities are endless! Please share your experiences with this recipe and your own experiments and suggestions! Previous Caveman (Primal) Approach and Intermittent Fasting. Progress Check-in! And Winter Adjustments. While in Japan, it can be difficult to find certain types of foods. I love greek food, and tsatziki is one of my favorite dips. So I decided to try and make some one day! Here’s my recipe. If I was able to make a decent (albeit shizo) tsatziki, anybody can!